Although Kazakhstan previously explored international partnerships to construct a nuclear power plant, the Kazakhstani Minister of Energy shelved preparations to build a plant indefinitely in 2015, citing Kazakhstan’s energy surplus. Kazakhstan has, however, cooperated with Russia and China on several other civilian nuclear projects. Kazakhstan housed the world's largest (Soviet) bioweapons plant in Stepnogorsk during the Cold War, and is now home to a significant number of anti-plague facilities that were part of the Soviet biological warfare (BW) effort. In June 2007, Kazakhstan acceded to the Biological Toxin and Weapons Convention (BTWC). Kazakh President Nazarbayev has declared Kazakhstan's commitment to biological weapons nonproliferation. Kazakhstan is not a member of the Australia Group. In 1993, Kazakhstan created a civilian body, the National Center for Biotechnology, to oversee the administration of most of the former BW facilities in Kazakhstan. These facilities include the following: Biomedpreparat, a large-scale biological production facility located in Stepnogorsk; the Scientific Research Agricultural Institute (SRAI) at Otar, which specializes in crop and livestock diseases; and Biokombinat, a small mobilization production facility located in Almaty that now produces vaccines. Kazakhstan reorganized these facilities in August 2005 under the National Center for Biotechnology of the Republic of Kazakhstan, with the goal of conducting research and creating a profitable domestic biotechnology industry. The Kazakh Scientific Center for Quarantine and Zoonotic Diseases (KSCQZD) (formerly known as the Central Asian Anti-Plague Research Institute) was also involved in the Soviet defensive BW system and is now under the jurisdiction of the Kazakhstani Ministry of Health. Both KSCQZI and SRAI house extensive collections of virulent strains of human, animal, and plant pathogens. Under the Cooperative Threat Reduction (CTR) program, Biomedpreparat has been dismantled and safety and security have been upgraded at KSCQZI and SRAI. In December 2004, the United States and Kazakhstan signed an amendment to a bilateral agreement that will expand cooperation against the threat of bioterrorism through the Nunn-Lugar Cooperative Threat Reduction Program. With completion expected in summer 2013, CTR’s Cooperative Biological Engagement program is funding the construction of the Central Reference Laboratory at KSCQZI to secure Especially Dangerous Pathogens. The goal of U.S.-Kazakhstan cooperation in this area is to counter the threat of bioterrorism and prevent proliferation of biological weapons technology, pathogens, and expertise at their source. However, Kazakhstan still possesses a small arsenal of Soviet era short-range ballistic missiles (SRBMs) consisting of the OTR-21 Tochka-U (NATO: SS-21-B Scarab-B) and the R-300 Elbrus (NATO: SS-1C Scud-B). Kazakhstan has an active space industry and inherited the Baikonur Cosmodrome from the Soviet Union. Baikonur is used for international space launches, including all Russian launches to the International Space Station (ISS). Additionally, Russia leases a segment of the Baikonur Cosmodrome for ballistic missile testing. Kazakhstan also inherited the Sary-Shagan anti-ballistic missile testing ground from the Soviet Union, and now leases the complex to Russia for continued ballistic missile defense testing. Kazakhstan's space industry provides it with dual-use technology and expertise; however, the country is committed to nonproliferation efforts and has shown no interest in pursuing a ballistic missile program. 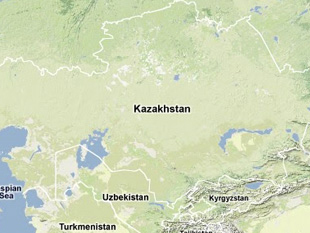 Syed Adnan and Athar Bukhari, "Cooperative threat reduction: Case study of Kazakhstan – Analysis," Eurasia Review, 13 June 2011, www.eurasiareview.com. "World Uranium Mining Production," World Nuclear Association, May 9, 2017, www.world-nuclear.org. "Uranium and Nuclear Power in Kazakhstan," World Nuclear Association, 1 March 2013, www.world-nuclear.org. Government of the Republic of Kazakhstan, “No need in building nuclear power plant in the next 7 years – K.Bozumbayev,” 2 November 2016, www.government.kz. International Atomic Energy Association, “IAEA Low Enriched Uranium Bank” Fact Sheet, March 2017, www.iaea.org. “Treaty on the Prohibition of Nuclear Weapons Adopted,” The Permanent Mission of the Republic of Kazakhstan to the United Nations in New York, July 8th 2017, http://kazakhstanun.com. Gulbarshyn Bozheyeva, Yerlan Kunakbayev, and Dastan Yeleukenov, "Former Soviet biological weapons facilities in Kazakhstan: Past, Present, and Future," CNS Occasional Paper, June 1999, www.nonproliferation.org. Alevtina Izvekova, "International assistance for Anti-Plague facilities in the Former Soviet Union to prevent proliferation of biological weapons," Nuclear Threat Initiative Analysis, 1 June 2005, www.nti.org. "Fiscal year (FY) 2013 President's Budget Submission: Chemical and biological defense program," Department of Defense, February 2012, http://comptroller.defense.gov; "Fiscal year 2013 budget estimates: United States Special Operations Command (USSOCOM)," Department of Defense, February 2012, http://comptroller.defense.gov; "Central Reference Laboratory in Almaty," United States Embassy in Kazakhstan, 19 January 2011, http://kazakhstan.usembassy.gov. Gulbarshyn Bozheyeva, "The Pavlodar Chemical Weapons Plant in Kazakhstan: History and Legacy," The Nonproliferation Review, Summer 2000, p. 141. Gulbarshyn Bozheyeva, "The Pavlodar Chemical Weapons Plant in Kazakhstan: History and Legacy," The Nonproliferation Review, Summer 2000, p. 143. "Kazakhstan: Pavlodar chemical plant's bankruptcy proceedings discussed," Kazinvest, 5 July 2007, www.kazinvest.kz. "R-36 / SS-18 SATAN," Federation of American Scientists, 29 July 2000, www.fas.org. Bagila Bukharbayeva,"Former Soviet missile factory is rare success story of U.S. defense conversion program," Associated Press Worldstream, 14 December 2004, Retrieved from LexisNexis. "Russia to Boost Air Defenses with Ex-Soviet States," RIA Novosti, 19 November 2010, en.rian.ru.